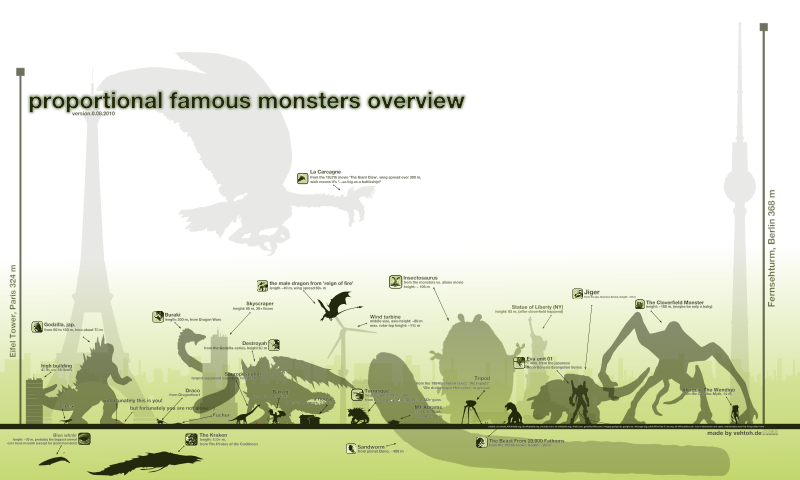 (klick for a higher resolution, PDF, printale on DIN A3) O.k., it isn´t already finished, but i think it is time to release the kraken the first edition of my proportional famous monster overview. I worked on this drawing since december 2009 (not the whole time ;). The basic Idea was to create an overview about some dragons and their sizes, witch i coulden´t find on the internet in one drawing. But after the first steps i thought: Why only reducing thing on the small group of dragons? Why not putting them all in one large picture? It was a lot of investigation to collect the necessary informations and artworks to build all these creatures and bring them together. But now it´s on a level, where i think this could be interesting for other peolpe and so - here it is. I´m sure there are some bugs in the graphic, so feel free to comment about them. Most of the work i´ve done with the free vector manipulation tool Inkscape, some prework in the nice image manipulation program photofiltre. The drawing is licensed under creativ commons, attribution, non-commercial, share alike. Oh and of course, some realy important monsters are still missed at this stadium like mothra, king ghidorah, the kraken, gamera, king kong and so on... So you´re also invited to comment some wishes for further versions. Thanks to all the people who like monsters und share their work an the net. This is realy great inspiration. If this drawing will get to version 1.x i will also release the scalable and modifyable vector file.